As a business owner or marketing professional working on behalf of a business, your aim is to get in front of as many eyes as possible and achieve those all important sales. If you have been considering the different online avenues available, you may well have come across the term ‘display marketing’, which is another paid service offered by Google. 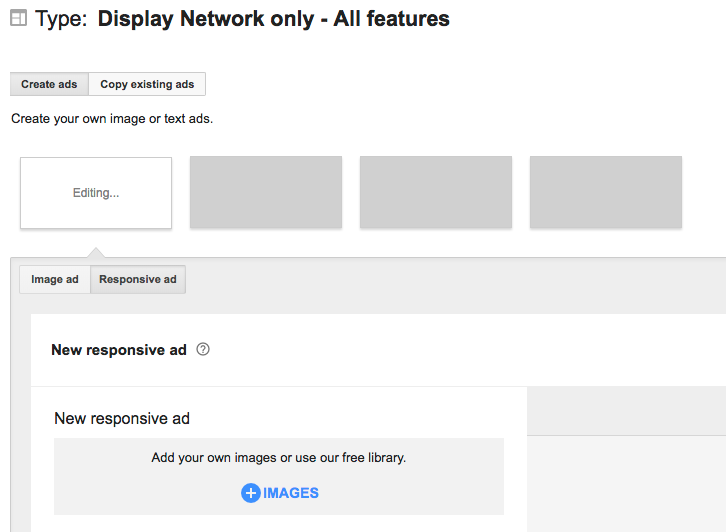 Forming a part of Google Adwords, alongside the Search Network is the Display Network, which provides you with the opportunity to display visual ads on websites across the internet. According to Google, the display network reaches 90% of internet users around the world and is available on over 2 million websites; highlighting the scale of opportunity on offer to you. But where do you start when it comes to setting up a display marketing campaign? Hopefully, this quick-fire guide should provide you with the basics so you can keep it close at hand when the time comes to set up your own campaign. 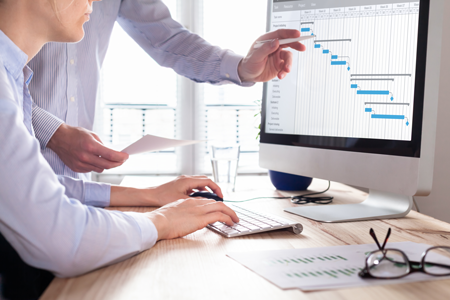 As with any marketing campaign, it’s important to set goals and KPIs so you can measure how successful the process has been, and this is the case with display marketing too. When it comes to goals, common options for display campaigns are to increase brand awareness, drive more traffic through to your website and encourage lead generation. To measure how successful these goals are, setting KPIs based on the number of impressions your display ads generate, the click-through-rate (CTR) on your ads and the conversion rates will help you see what is working and where improvements can be made. You need to make sure the ads you generate serve the right audience, otherwise, you’ll be left spending a lot of money with next to no return. By identifying who it is you want to target based on features such as demographic, location and common behavioural attributes, you’ll be on the right path. By understanding who your target market is and where they operate on the web, you’ll be able to ensure your display ads appear in front of their very eyes. Don’t forget too that with Google’s display network, you can also set up re-targeting which essentially sees your ads follow anyone who has been on your website previously around to any of the other sites they visit. If they haven’t completed an action, such as purchasing or completing a form, you can ensure you remain in their mind with posts that appear on any other sites that support the network. 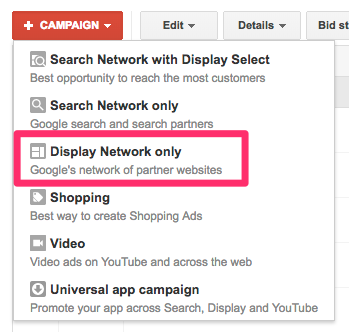 On signing in to your Google Adwords account, you’ll be shown your main account dashboard. 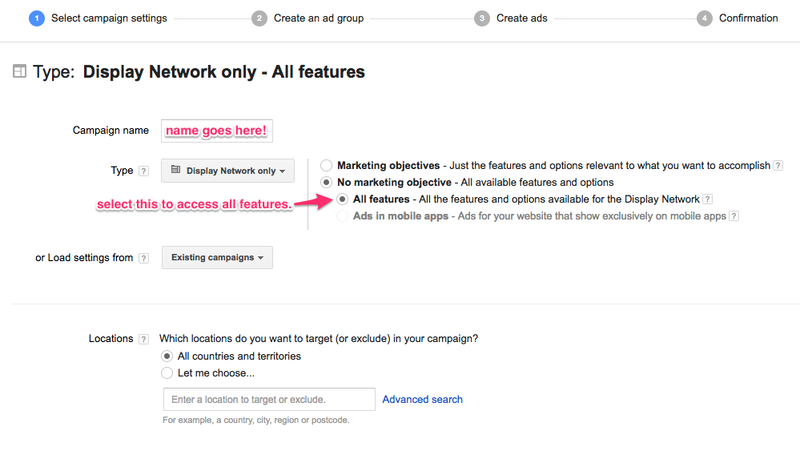 To set up a new campaign, click on the ‘+Campaign’ tab and select ‘Display Network Only’. The next stage of the process enables you to give your new campaign a name. Make sure that the option to have ‘All features’ is selected so you have access to all of the features and options available to those using the display network. Following this, you’ll be prompted to select the location you want your adverts to appear in, which you should have identified earlier on in the process. You can keep this broad or really narrow down your location to target specific locations around you. On adding the locations to target, the next step sees you select your budget, therefore how much you want to spend on your ads per day. This step also gives you the option to select a specific bid strategy, however for first-time users of the display network, it’s worth sticking with the ‘Manual CPC’ option as this gives you complete control over what you are spending and where. Once you’re happy, select save and continue to be taken to the next stage of the process. This is the stage of the set-up process where it really starts to get interesting as you begin identifying where you want your ads to appear. First, give you ad group a name and input your cost per click (CPC) bid, which is how much you are willing to spend each time someone clicks your ad. 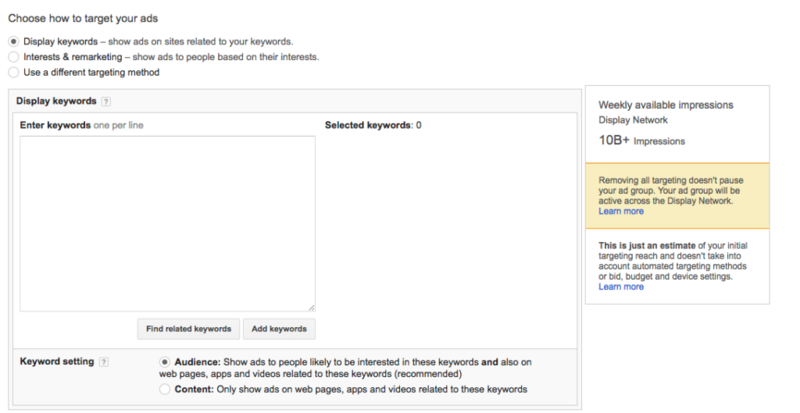 Start lower as you can adjust this later in line with the advice Google gives you once your campaign is up and running. Next, we move on to the section entitled ‘Choose how to target your ads’. For the first use of the network, it is best to stick with the ‘Display keywords’ option as you can control your ads to show on sites related to the keywords you identified earlier. Add your keywords in and if you want to bulk up your list, you can always use the ‘Find related keywords’ option which sees Google generate similar keywords in line with those you have already added. 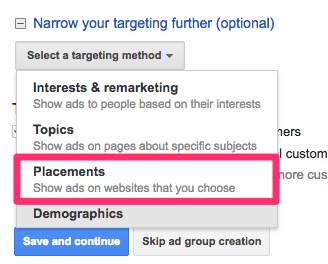 If you want your ads to show on specific websites too, simply click on ‘Narrow your targeting further’ and select the ‘Placements’ option. You then input all of the sites you specifically want your display ads to appear on. Now you have targeted your ads, the creative process begins. Whilst you can add text ads in this section, we’ll focus on image ads. If you’ve already created a catalogue of ads you want to use, you can easily upload them by clicking on ‘Image ad’ within the ‘Create Ads’ area. If you don’t have any ads already designed, you can paste your website URL into the available section and allow Google to come up with some ad ideas for you if you’d prefer. You’ll be presented with a variety of designs, with any that stand out to you being editable so you can add your own information in there. Once you have your designs in place, your campaign is ready to begin. 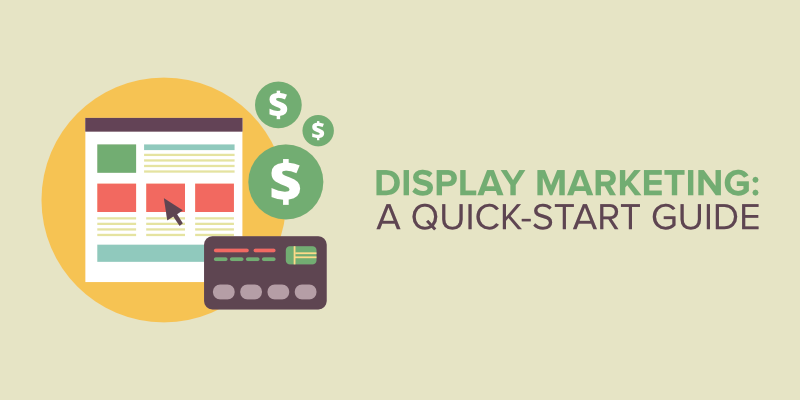 It is incredibly important to keep a close eye on your display marketing campaign so you can identify if your budget is being spent quickly or if your ads aren’t getting the results you had hoped for. It’s important to remember that display ads tend to have the lowest click-through rates of all paid advertising, however, if you notice low rates across your ads, it could be that they are not engaging enough to pull people in. Why not take a look at the ads that stand out for you on different websites and replicate what it is that makes them ‘click-worthy’ in your own designs? To conclude, a display marketing campaign has the potential to expand the reach of your business incredibly; building awareness and encouraging more people to pay your website a visit. As a result, with a well-run campaign, you could see your revenue soar!